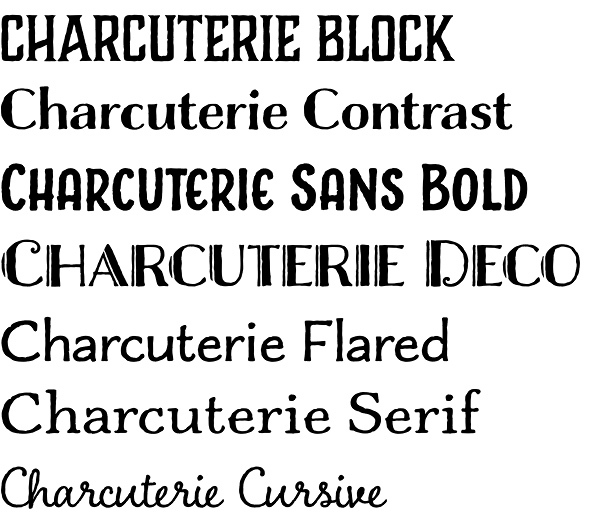 Charcuterie font is an amazing type platform by Laura Worthington. Most type designers (even the top one) usually design a single typeface developed in many different weights, featuring alternates, swashes, ornaments, ligatures and many other useful stuff. That is what we are used to see. Unlike all masters of type Laura Worthington has just released her tremendous work in type design – the Charcuterie font. It will not be correct and even fair if we describe it just as “font family”. The Charcuterie is advanced and very sophisticated type platform that incorporates different fonts and decorative ornaments representing the type identity of early 1900s. Speaking generally if you want to create vintage design with authentic letterpress look, you have to use the Charcuterie type platform. You could pick your headlines from 4 Charcuterie Block fonts, then you could ake your body text choosing from Charcuterie sans, serif or flared and then make your special announcements using Charcuterie Engraved, Etched, Filigree, Deco or even use the amazing Charcuterie Cursive. 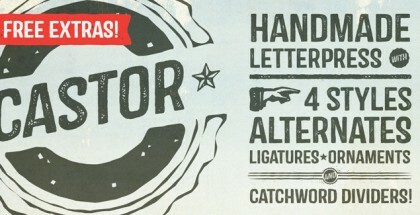 All these fonts are supported by three additional ones – Catchwords, Frames and Ornaments. All listed fonts are using Open Type features so you could easily customize your design, text or decoration. We’ve never seen anything better and more complex than this entire system. Moreover – it is now available on full 50% discount till September, 9th! Don’t miss your chance – get it now and feel the freedom of classic vintage design at its full power!